Tech Procurement Patterns. Redefining the Role of IT. Today’s typical IT estate looks a lot different than it did just a few years ago. For one, a good portion of it is probably in the cloud. Projections recently published by Gartner point to the public cloud services market growing 21.4 percent in 2018 to $186.4 billion—up from $153.5 billion in 2017. This matches the growth of all service-based delivery models, with Software-as-a-Service (SaaS), Infrastructure-as-a-Service (IaaS) and practically Everything-as-a-Service allowing organizations to scale up or down on demand for any given application. With these new service options and capabilities, CIOs and IT leaders should theoretically have better control of their enterprise networks than ever before. However, research recently commissioned by Snow Software suggests otherwise—in a report titled, Why IT needs oversight if digital investment is to succeed, 24 percent of IT leaders see a majority of IT spend decisions having already shifted to business units, while a further 19 percent say control is starting to shift away from the IT department. Why is this the case and how are IT leaders supposed to answer for technology spend outside of their control? The answer may be to take a wholly new approach to technology management. Cloud deployment has enabled a shift in technology purchasing power away from the IT department and toward business units. Individual departments and functional heads may more readily buy and use technology on their own, in some instances entirely bypassing the IT team. Sales and marketing departments are the most prone to acting autonomously this way. According to a 2017 Forrester report, C-Suite Tech Purchasing Patterns, CMOs are the C-level executives most likely to take control of their technology spending, with more than one-third—36 percent—of new marketing-related tech investments fully controlled by CMOs and a further 19 percent initiated by the CMO with later involvement by the CIO. Business units will buy and use software without IT because they can, and they want to. When it comes to this new path of technology procurement, the horse has left the barn, which means CIOs and other IT leaders need to adapt. 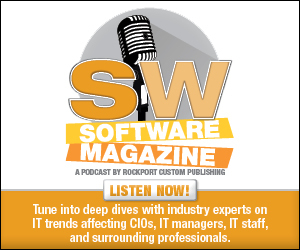 IT leaders can be successful in this new age of diffuse responsibility for tech procurement if they strive to become stewards of IT spending—for example, relinquishing some control, but establishing themselves in a position of influence over tech investments across the organization. The key to achieving this position is building a holistic view of all IT consumption. Standing in the way of total visibility is what we terms the “Disruption Gap”—the delta between what IT thinks they know about technology usage in the organization and what is actually being consumed. The Disruption Gap is primarily fueled by the above mentioned business unit technology purchasing and allowing this gap to exist and grow wider in an organization makes duplicate spending, unused software licenses, zombie virtual machines and security or compliance threats more likely. To close the Disruption Gap and move toward tech stewardship—not dominance—CIOs and IT leaders need to create a single source of truth for all technology consumption across the enterprise. There are a few reasons cloud-deployed software can be difficult to track. In addition to the lack of IT involvement in the purchasing process, most SaaS vendors and IaaS platforms provide dedicated portals for viewing and tracking usage and spend. As cloud usage grows, it simply isn’t practical for IT departments to consolidate information across each of these separate portals. IT organizations need automated discovery tools and consolidated, single-pane-of-glass views of all cloud usage to be effective in this new era of IT procurement. In addition to discovery and centralization, it is incumbent on IT to build self-service capabilities whereby end-users can request access to SaaS products and provision IaaS environments. By centralizing technology provisioning, IT departments can better understand and track technology usage. While the balance of power in technology spending is likely to continue to shift away from IT, leading CIOs see this as an opportunity to redefine their roles and create better alignment with the overall business goals. These new tech procurement patterns allow IT to focus less on keeping the lights on, and more on being an innovative and consultative function in their organizations. The insights delivered by their single, centralized platform for technology management make for more effective counsel in business-led IT initiatives and eliminate risk or uncertainty when it comes to spending. Better yet, it can justify certain technology investments and guide those in the future. Tim Jesser is the director of global product marketing for Snow Software.